Assuming you speak to your doctor and your attorney shortly after your injuries, the two biggest factors that go into determining how long it will take before your case is over are (1) how long your medical treatment takes, and (2) how reasonable the at-fault party’s insurance company is. We obviously do not want to settle your case while you are still treating because at that point we don’t know what the extent of your injuries is going to be, including whether and to what extent you’ll get better. Sometimes insurance companies are reasonable, meaning they accept liability when their insured is at fault and they recognize the value of your losses and compensate you fairly for them. But often the insurance companies do whatever they can to keep from having to pay you, which means the attorney really has to work for towards payment, including filing a lawsuit, which takes considerable time and effort. Typically, a case that settles before a lawsuit will take anywhere from four months to two years. If a lawsuit is necessary, most cases will resolve within 18 months of the lawsuit being filed, but it can take considerably longer, and in rare cases it can take as long as five years to get to trial. If there are appeals along the way or after trial, it can take even longer. Hopefully you were able to see a doctor immediately after you were injured. Not only do your prospects of recovery improve if you don’t delay getting treatment, but your prospects of recovery do, too. Insurance companies love to try to reduce the amount they have to pay by alleging that treatment was delayed or there are gaps in treatment. When seeking medical treatment, it is important that you inform your doctor of all injuries you’ve sustained and inform him or her of all prior injuries to the same body parts. You must also show up for all your appointments and follow your doctors orders exactly. Failure to do so could not only slow down your recovery, but it could also negatively impact your case. It is imperative that you notify your lawyers when you are done treating so they can begin the negotiation phase. Once you are done with the medical treatments (meaning you have fully recovered or you are at maximum medical improvement), we will finish collecting all your medical and billing records, evidence of lost work, and any other proof of loss. We will then evaluate your claim and discuss it with you. We will draft a demand packet wherein we set forth the facts of your case, including the mechanism of injury and your injuries and other losses—lost wages, loss of consortium, loss of enjoyment of life, loss of earning capacity, etc. We will also lay out the law that entitles you to reimbursement for your losses. In the letter we will ask the insurance company to compensate you, and the number we select as our demand will be based on our evaluation and our discussions with you. After the demand letter, the insurance company typically responds with an offer. At that juncture, we will inform you of the offer and discuss further negotiations. If, during this process, we are able to reach an acceptable settlement, the insurance company pays you in exchange for a release of claims. If the insurance company is not willing to pay an amount you are willing to accept, then we initiate a lawsuit. In some cases, there is no negotiation. Either we opt to go directly to a lawsuit, like where the statute of limitations approaches before you have completed treatment, or where the insurance company outright denies your claim and does not make an offer. To file a lawsuit, we prepare a formal complaint laying out our legal theories and then serve it on the defendant. Although lawsuits are timely and expensive, they also afford greater opportunities to discover evidence using the subpoena power of the court. This can be a powerful tool for proving your case. If we end up filing a lawsuit, that does not mean the negotiations are over. Settlement negotiations occur, before, during, and after a lawsuit. Once we file a lawsuit, however, we are no longer negotiating with an insurance adjuster, but with an attorney for the defense. Sometimes this facilitates negotiations. Other times it frustrates them. If we cannot reach a settlement during the lawsuit phase, we eventually reach a point where someone else—either an arbitrator, a judge, or a jury—will be evaluating the evidence and making a decision about whether the defendant is liable, and if so, for how much. Some clients prefer to reach a settlement because then the parties can determine the outcome of their own case. If the case goes to arbitration or trial, the outcome is often unpredictable, but with risk often comes greater reward. 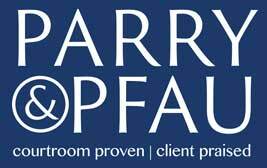 At Parry & Pfau, we navigate the complex legal world every day. Contact us if you have any questions. Older PostIs It Legal to Join Ashley Madison?